I have a long-standing aversion to champagne cocktails, mostly on the basis that I think it looks unmanly to hold one at a bar. The only glass more feminine than a champagne flute is a hurricane, but both are OK in the proper context. If you are sitting on the beach at a resort, a hurricane glass full of coconut cream and rum, or even a bit of blue curaçao is probably ok, but if you order something like that in a bar on a Saturday night, I will probably make fun of you. Combine in a glass and garnish with an orange wheel. Briefly stir gin and Campari together, and strain into a champagne flute. Top with 3 oz Prosecco and garnish with an orange wedge. This was shockingly delicious, but I think it would have been just as good, and more appropriate to its name, if it had been made with Grappa instead of Gin. Alas, I do not have any Grappa, and I did not want to use Pisco, even though it’s a close approximation than gin. So the 50 in this comes from the fact that it is a 2/3 Italian 75, which multiplies out to be the Italian 50. Next time I’ll get some Grappa, and we’ll get all the way to 75. The French 75 is essentially a Tom Collins with Champagne instead of sparkling water, meaning it makes use of lemon juice for its bracing quality. 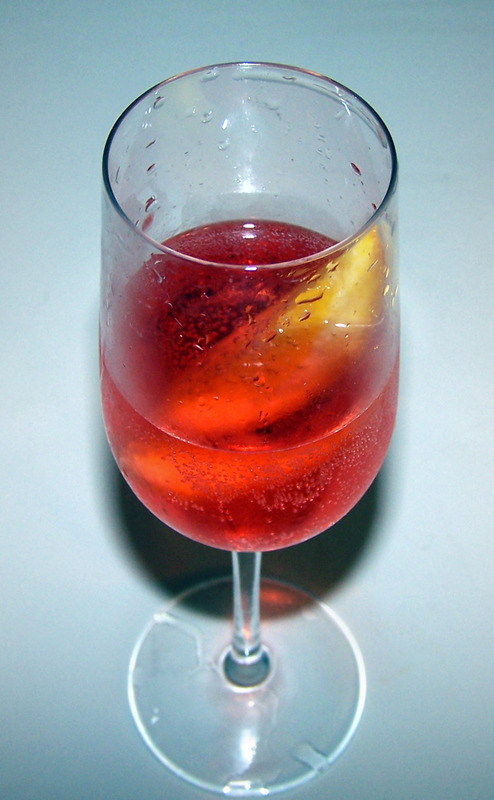 In the Italian 50, I am using Campari for this purpose instead, changing the drink from a sour drink to an aromatic one. In any case, the biggest win here is inherited from the spritz, which highlights the orange notes in Campari with a wedge of fresh orange. The aroma of orange when drinking this drink creates a decadent synergy with the Campari. You could use Cynar instead of Campari, and if you do that, then I suggest a wedge of lemon, which is much more suited to Cynar than orange. Categories: original creations | Tags: aperitif, aperitivo, bitters, booze, campari, champagne, cocktail, cocktails, cynar, drinking, drinks, gin, mixed drinks, mixology, orange, prosecco, spirits, spritz, The French 75 | Permalink.